Its been a while since I am working on GWT(Google Web Toolkit) and its wrapper framework like ext-GWT (which is called as GXT) and have come across lots of new widgets and containers. 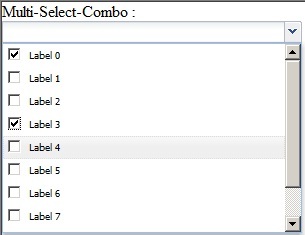 One recent feature request, I had to work on recently, which caught my attention was Mutli-Select ComboBox. How its different from normal ComboBox? Now as I went on to analyse the implementation of this widget, I remembered a component from GXT called CheckBoxListView. Which is a list view comprising of CheckBox components. As I found this component perfect to select multiple values, I went on to integrate it with TriggerField. I thought of creating a Dialog widget which will act as ComboBox "option provider" and reacts to the user click event on TriggerField to either hide OR show the options. 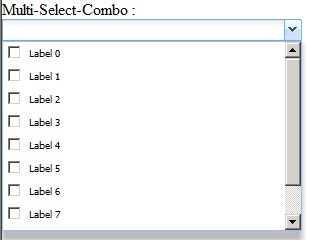 Finally, add the CheckBoxListView component to the Dialog and now the Multi-Select ComboBox is ready to use! Here is the complete code listing..
And it can be used from any part of your application like below example..
this is a nice way to do this.. But i found what i felt was better as it extended comboBox..
Its not working. It Just shows a TextField !!. Can you please help. Why it is happening ? Can you please tell me which version of GXT you are using?. At least this code should show a "Trigger field", which means a textfield with down-arrow attached to it. - numpad bug. (if i press '1,2,3...' from numpad it giving 'a,b,c....' values). Please let me know in case any idea.